Liam Gallagher performed in Istanbul's Küçükçiftlik Park on Aug. 14. In a loose-leaf photo album – something only people from a certain age group can claim to have – dedicated to my first visit to the U.K. in 1997, there is a photo of me standing in front of a music shop, next to a large Liam Gallagher poster. It was the year of "Be Here Now," the Blur-Oasis feud, and the year of the Labour win. Everything was happening at the same time, and Liam Gallagher's face, along with his brother Noel's, was everywhere. It is impossible to see those faces and not think of a certain era. And indeed it was Liam's face we saw on the evening of Aug. 14 at Istanbul's Küçükçiftlik Park, on a huge screen behind the very person of Liam Gallagher singing his songs to a positively delirious audience. I had gone expecting to see people my age, people who were young in the '90s, but was pleasantly surprised to see that many kids in their twenties had found time to listen to, and indeed memorize the lyrics to all of Gallagher's songs. It is, of course, quite a bold decision to have your face magnified to a hundred times its size for all to see, but you know Liam, he really couldn't care less. He and I look both very different to that photo from 1997, but the way he holds his body, away from the microphone and tilting himself towards it remains his trademark. It's a sort of naughty child position who defies authority but wants to be heard all the same. 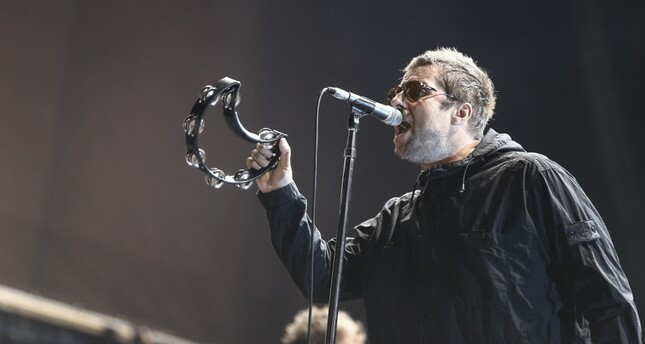 His almost neighing voice saying "I'm free to be whatever I/ Whatever I choose and I'll sing the blues if I want" embodies his philosophy – if it is for philosophy you've come to the Gallaghers. After Turkish supporting acts including "Mor ve Ötesi," the audience was put into a Britpop mode by Starsailor. The band's vocalist James Walsh treated the audience to solid and mellow rock and roll numbers and encouraged us to join in. He wished the audience a great night with Liam, telling us that he remembered queueing up for Oasis tickets when he was "this big." Walsh's mellowness has actually been recorded in Britpop history, as he became one of the characters who got caught up between the never-ending feuds and truces between the brothers Noel and Liam, which all ended happily through Walsh being the nice man that he is (you can read all about the episode in the 'NME'). After Starsailor, many members of the audience sat where they were waiting for Liam to appear. A group of young men sitting near me was watching football (the game between Fenerbahçe and Benfica) on their smartphones, something Liam would definitely approve of, being a fervent supporter of Manchester City himself. In fact, the concert opened with the Manchester City Champions Chant. There were several people with Manchester city scarves in Küçükçiftlik Park which pleased him. There were also several with headbands with Liam Gallagher written on them – the sort Istanbul hawkers will produce in no time in relation to any public event. As the sound system was being prepared for Liam, I struck up a conversation with the girl standing next to me. A mere 23, she asked me as you do in these situations "Oasis or Pulp?" and I answered, immediately "Pulp." But my loyalty to Jarvis Cocker is never an impediment to enjoying Liam. In the heady decade of the '90s, everyone had their favorite Britpop band, and indeed their favorite Gallagher. Not choosing a side was not an option. When Liam appeared on the stage, some Turkish fans decided to welcome him by shouting "F------ Noel!" One may think that was a bit much, but when you consider that the way Liam himself complimented the audience with "I've never been to Turkey before. You've got a f------ beautiful country!" you understand what kind of jolly environment we were in. The way Gallagher speaks holds his body, points to individual members of the audience saying "I like your shirt!" you feel you are always in that pub environment. The feeling that things can go either way any minute – and that is, and has been the pull of Oasis. When rock stars go on to solo careers, the audience is always wondering which – if any – songs from their band albums they will sing. After a few songs from his 2017 album "As You Were" Liam asked "Ever heard of Oasis then?" and then went on to sing "Whatever." He followed it with "Supersonic" and "Live Forever" which he said was going to be the last song, but we knew that he still had 10 minutes to spare, and in accordance with tradition, yelled and whistled to get him back on stage to sing one more. It was, as it should be (though a part of me wanted it to be "Don't look back in anger") "Wonderwall" – which must work perfectly on this international tour, for he changed the lyrics to "There are many things that I would like to say to you. But I don't know Turkish," which, as you can imagine, got wild cheers from the audience. I'd always read the lyrics of "Wonderwall," written by Noel, as being about a has-been rock star that the Gallaghers must have looked up to "Backbeat the word was on the street that the fire in your heart is out. I know you've heard it all before but you never really had a doubt. I don't believe that anybody feels the way I do about you now." The last line has always felt very melancholic to me, and it could be melancholic to sing it as the now 46-year-old solo singer of a successful band from the '90s. But we need not fear. Liam Gallagher still attracts young audiences, and a lot of people still feel about him the way I used to two decades ago.